How could I not post a picture this cute? These are our Calm Energy greyhounds, Turtle and Monkey, in their winter “Doggy Duds” – custom made Greyhound coats by Cozyhorse.com. Cozyhorse is a little company that handmakes horse blankets, and now dog coats out of the same great materials. We call them their “crossing guard uniforms”. Yes, maybe the colors are a little much. You won’t lose sight of them though! Just for the record, I have no affiliation with Cozyhorse.com and no other reason to blog about it than to pass on a great product (oh yeah, and to post a cute pic). 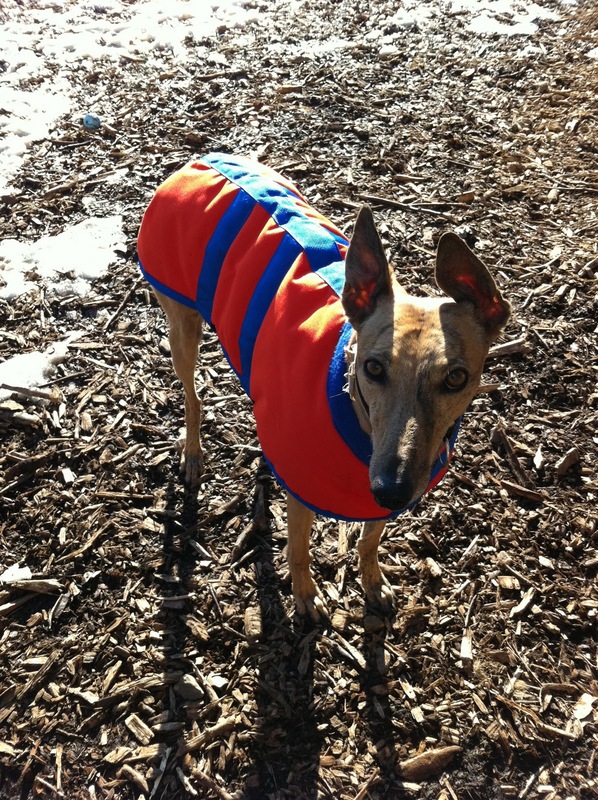 I’ve tried dozens of Greyhound coats and these are among the best I’ve found. They’re super-warm horse-blanket stuff (whatever that is), custom-fitted (you email Cozyhorse precise measurements of your dog), and the long velcro attachments keep them firmly on even when MonkTurt are racing at top speeds or roughhousing with Pitbulls. The custom-fit means no, umm, soiling of the sides by Turtle when he decides he so desperately needs to put his mark on that shrub over there. And I’ve always had problems with other coats coming loose while running; not these. 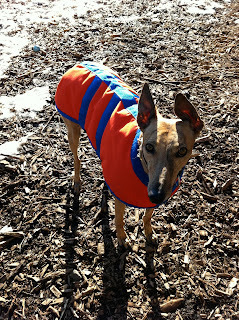 And yes, they make coats for non-Greyhound dogs too.